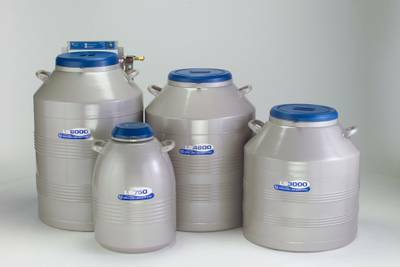 Taylor-Wharton cryogenic storage containers are based on the principle of complete thermal insulation. They consist of an inner vessel and an outer body separated by a stable vacuum, which virtually precludes any transfer of heat from the ambient environment to the inner vessel. Additional layers provide what is refeered to as superinsulation to protect the vessel against the warming effect of infrared radiation. 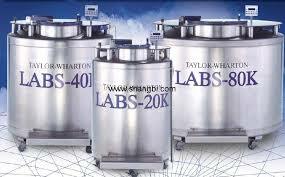 Taylor-Wharton cryogenic vessels are designed to hold either canisters or racks. Depending on the application the material can either be stored in the liquid phase or in the vapour phase of the vessel. 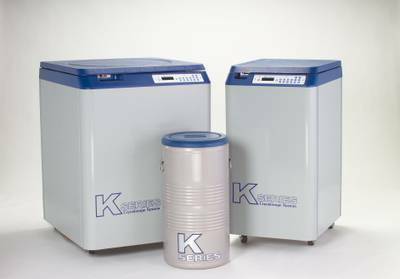 XT (eXtended Time) Series refrigerators are cryogenic vessels designed for long-term storage of a variety of materials at cryogenic temperatures. XT vessels permit holding times of up to 340 days. These extremely long holding times ensure economic operation. Typical users include research institutes and laboratories as well as pharmaceutical firms and artificial insemination centers. XT vessels are used primarily to store straws but are also used to store vials when long holding times are important.This series also offers a low profile model (XTL) for use in more confined workspaces. HC Series (High Capacity) refrigerators are designed to provide greater storage capacity in vessels with approximately the same dimensions as those of the XT Series. HC Series refrigerators are used for essentially the same applications as those of the XT Series. The choice between the two series depends on the specific requirements of the user. 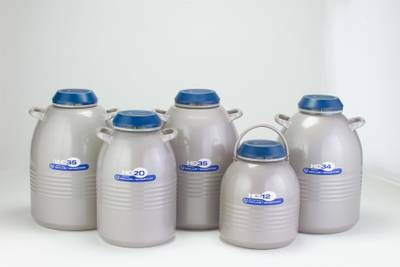 HC vessels are used primarily to store material in vials or for applications that involve larger quantities of straws. The HCL vessel is especially compact, which makes it ideal wherever space is limited. The LS Series refrigerators are uniquely designed for large vial capacity in convenient box-type storage racks and at the same time keep NL2 consumption to a minimum. This results in low operating costs and fewer re-fills. The rectangular shape of the racks for 5 x 5 or 10 x 10 cryoboxes makes it easier to maintain an overview of and identify stored samples. As a result, samples can be located and removed more easily and faster. The four vessels cover a range from 750 to 6.000 -2 ml vials. The compact LS 750 can be used with either racks or with canisters. The LS 3000, LS 4800 and LS 6000 models can be equipped with automatic level control and they can be supplied with CE mark in compliance with the Medical Devices Directive (MDD 93/42EC). These models can also be used for storage in either the vapor or liquid phase. In case of storage in the vapor phase, the two bottom shelves must be left empty, which reduces the capacity The use of level controller is recommended. Taylor-Wharton K Series systems are designed to accommodate various inventory control systems. The high capacity makes it possible to hold up to 38,350 2ml vials or up to 739,500 0,25ml straws. Normally 10 K and larger systems are connected to a liquid nitrogen tank by means of a hose (see equipped with a CryoCon unit, which is an electronic Taylor-Wharton automatic level controller that is available in various models. In case it is necessary to make absolutely sure that specimens do not come into contact with liquid nitrogen (to avoid cross contamination), it is possible to place a gas phase frame inside the system. The liquid tight frame ensures a reliable separation of the specimen from the liquid nitrogen and at the same time functions as a guide for the individual racks. 10K and larger systems are available with the CE mark in compliance with the Medical Devices Directive MDD 93/42 EC. LABS Series freezers are designed for efficient long-term storage of larger volumes of specimens. 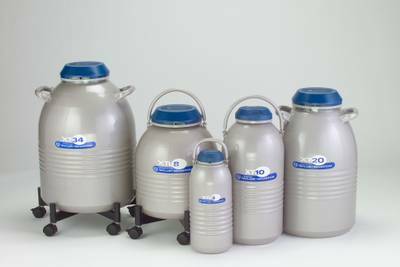 With a capacity of up to 80,000 2ml vials, a storage temperature virtually at the level of the liquid nitrogen temperature even in the gas phase and low nitrogen consumption, the LABS Series sets new industry benchmarks. In addition to this exceptional performance, these freezers also feature ergonomic design. For example, the flat stainess-steel table-top makes a convenient working surface, and a folding step permits easier access to the stored material. The extremely easy-to-rotate turntable with aluminum deviders permits quick, convenient access to the inventory control system as well as easy sample location. Each compartment is colour coded. All models are available with automatic level controllers and the CE mark in compliance with Medical Devices Directive MDD 93/42EC. The hinged booted lid is easy to operate and to clean. The lid switch provides signals to the optional controller for lid open alarm, auto defog and quick chill. for the Sample storage container product line.